I’ve been using Lync for about a year now. Like most folks, I figured out the basics pretty quickly. Many features—such as availability based on Outlook calendar, or the share screen option—are self-explanatory. To my delight, though, I’m often learning about new features. The latest surprise from Lync happened the other day, when a colleague from a remote office called me right after I finished a meeting. I was surprised to hear him say that. I’d literally just hung up a moment before. “Oh, I didn’t think you were on that call,” I said. Notifications of presence changes — who knew? I didn’t know you could do that in Lync. But it’s pretty simple. And as I was digging, I realized that there was a lot I didn’t know you could do with Lync. Here are a few of the features that really caught my attention. Get notified when a contact becomes available. You can activate this feature selectively on a contact-by-contact basis. Respond to an email using Lync. The email subject line will appear in the chat window message for easy reference. Switch directly from a Lync chat to an Outlook email with the same person. Manage all your Lync conversations from a single chat window. Instead of having a bunch of windows open, you have one window with a number of tabs. This makes it easy to monitor and switch between all your active chat sessions. Use Lync from any device, even if Lync isn’t installed. This little bit of magic is accomplished by logging in to Outlook Web App. It makes it really easy to track down colleagues when you’re logging in from Aruba during your vacation. Add a URL for a Lync Online meeting to an Outlook meeting invite. This makes it easy to get people together. Create a group whiteboard. This lets your group brainstorm ideas literally on the same page. Share control of your desktop. Collaboration can be even easier when you allow other people to work on your documents or within your apps. Establish standing “chat rooms” for groups or projects. You always know where to find each other. 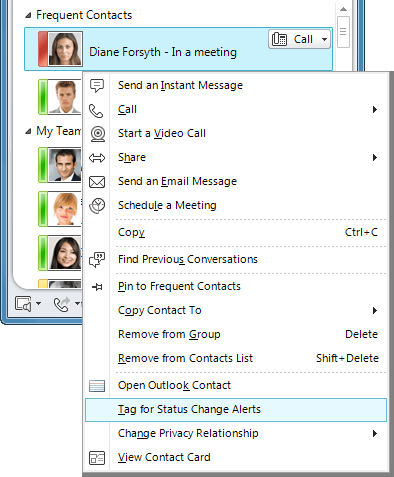 Lync Enterprise even offers control over access and rights. Set up a “lobby” for online meetings. Attendees can make sure they’re in the right place. And you can see who comes in and control attendance before starting a discussion. Want to learn more? Here are 7 reasons to use Lync for communication and collaboration.